When I began my medical career in Hong Kong in the early 1980s, I chose to focus on hepatitis B, in part because it was very common and because the hepatitis C virus had not yet been discovered. I witnessed the devastation that this virus caused — cirrhosis, liver failure, and liver cancer — and the lack of treatments we could offer to patients. Back then, scientists knew there was another type of hepatitis, but no one could identify it, so we called it non-A, non-B hepatitis. I would never have imagined that during the course of my career I would witness the discovery of what came to be known as hep C and the development of a cure for nearly all patients with chronic hepatitis C in 2014. The development of treatments other researchers and I have seen over the past 30 years reflects the amazing progress the field has made in tackling hepatitis C in a relatively short period of time. But today, in light of the opioid crisis, effective treatment for hepatitis C has become even more relevant. In the U.S., the number of new hepatitis B virus and hepatitis C virus infections decreased for many years, but this trend has been reversed during recent years due to the opioid epidemic, as more people use injection drugs, share needles or other paraphernalia, and practice high-risk sexual behavior. Initially, in the late 1980s, before a diagnostic test became available, some physicians started treating well-characterized cases of non-A, non-B hepatitis (hep C) with interferon, a natural protein that the body makes to fight viruses, and ribavirin, an antiviral drug. These medications were not specifically developed for hepatitis C, had to be given as injections for 6–12 months, had many side effects, and resulted in a cure in only half of the patients who received treatment. It took more than two decades for the first direct-acting antiviral drugs to be approved by the FDA. I remember the excitement when I and my colleagues tested one of the new drug combinations in patients, and we saw the virus count drop from more than 1 million to fewer than 20 within two weeks. We published the results of our pilot study in the New England Journal of Medicine in 2012. Although the study involved only 21 patients, it was considered a watershed moment because it was the first study to prove that a combination of oral pills without interferon can cure hepatitis C.
The first combo pill that inhibits different steps in hepatitis C replication was approved by the FDA in 2014. This pill is taken once a day for 8–12 weeks, has little to no side effects, and improves the cure rate to 90–95 percent. It was hailed as magical, but it came with a price tag of $94,500. That led many insurers in the United States and national health departments in other countries to limit access to treatment. While the current price of hepatitis C virus drugs is still very high, one needs to remember that for 95 percent of patients, this is a cure. It is unlike medicines that need to be taken for a long time, sometimes for the rest of the patients’ lives. Indeed, a cure for hepatitis C virus has allowed some patients who were on the liver transplant waiting list to reverse their liver failure, making transplantation unnecessary. The remarkable success of hepatitis C treatment has reenergized efforts to find a cure for hepatitis B. Current treatments can suppress hepatitis B virus replication but do not eliminate it, and most patients need to be on long-term treatment. Learning from the hepatitis C experience — and with a better understanding of the biology of hepatitis B virus and improved animal models — drugs that target different steps of the hepatitis B virus life cycle are being developed. While a cure for hepatitis B will be more challenging because it can integrate into the patient’s DNA, enabling it to evade the patient’s immune response, I am optimistic that we will witness the availability of new combinations of drugs that will move us nearer the goal of a hepatitis B virus cure. But the news is not all positive. We’ve seen mortality rates from HIV, TB, and malaria decline in recent years, but mortality from hepatitis B and C has risen. Globally, an estimated 257 million people have chronic hepatitis B virus infection, and 71 million have chronic hepatitis C virus. Together, hepatitis B and C caused 1.34 million deaths in 2015. This led the World Health Organization to challenge countries around the world to develop national plans to eliminate these two viruses by 2030. Hepatitis B virus and hepatitis C virus are usually spread through contact with blood or body secretions, through sharing needles, or through sexual exposure. But they can also be spread through contaminated needles used for medical treatment, which continues to happen in many parts of the world. In addition, hepatitis B virus can be spread from infected mothers to newborn babies unless a vaccination is given immediately after birth. 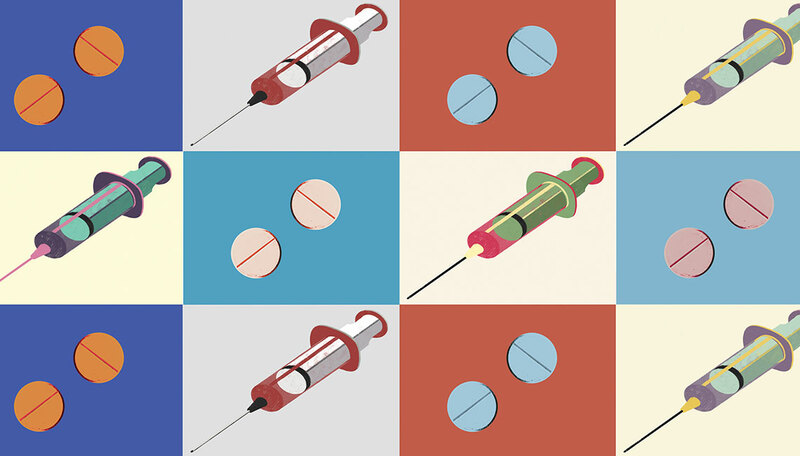 In the U.S., the number of new hepatitis B virus and hepatitis C virus infections decreased for many years, but this trend has been reversed during recent years due to the opioid epidemic, as more people use injection drugs, share needles or other paraphernalia, and practice high-risk sexual behavior. This is particularly true for hepatitis C, where the number of new cases in the past 10 years has more than doubled, highlighting the need for a preventive vaccine. The increase in the number of new cases of hepatitis B is smaller and mainly seen in adults in their 30s, because most younger persons have been vaccinated. Although I marvel at how much progress we have made in the last three decades, and am delighted to be not just an observer but also a contributor to the progress, our work is not finished. Much more needs to be done to completely eliminate new cases of viral hepatitis and deaths from chronic hepatitis B and C.
Anna Lok, M.D., is the Alice Lohrman Andrews Research Professor of Hepatology, assistant dean for clinical research, and professor of internal medicine. A version of this article initially appeared on The Conversation.